The iQ Series AL-E generator’s standard configuration includes time and energy control along with patented Trigger by Power. The display is a high-resolution multicolor LCD with large easy-to-read text. One-touch hot keys along with a multilingual menu make programming and operation virtually effortless. Built-in circuit protection and visual fault status readouts ensure reliability even in the toughest work environments. The AL-E version of the iQ Series power supplies is designed for applications that require 600 watts of power or less. 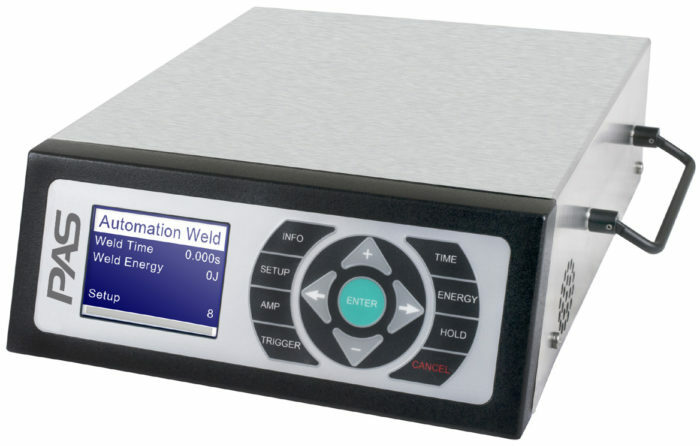 It is an excellent choice for single-station, automated, continuous low-wattage or medium-duty cycle, plunge weld systems that require basic I/O communication. The power supply is compatible with PAS’s superior line of conventional converters and probes, and is also well suited for nontraditional, ultrasonic applications that require rigidmount, compact, or wide band converters.